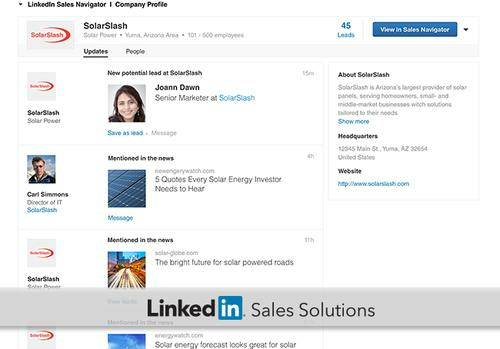 Aimed at sales professionals, Sales Navigator is designed to add sales features to LinkedIn's namesake social networking service. For example, users can tap the tool to find and target prospects more quickly, ultimately leading to a shorter sales cycle, the company says. Now, by integrating Sales Navigator features within Microsoft's Dynamics CRM platform, the new update aims to help salespeople get their work done without having to switch from tool to tool. Sales Navigator users can now send connection requests and messages and use InMail directly from within Microsoft Dynamics CRM, for example. They can also find new leads directly in Microsoft's platform. Meanwhile, when a user views a prospect's profile inside Dynamics CRM, the TeamLink feature in Sales Navigator will display people at the user's own company who are connected to that prospect, thereby paving the way for smoother introductions. The upgraded Sales Navigator application supports the 2011, 2013 and 2015 Microsoft Dynamics CRM versions, both online and on premises. It is available only to Sales Navigator users with team accounts and must be installed by a Dynamics CRM administrator. Earlier this month, LinkedIn also released a version of its Sales Navigator mobile app for Android. It's now available on the Google Play store.